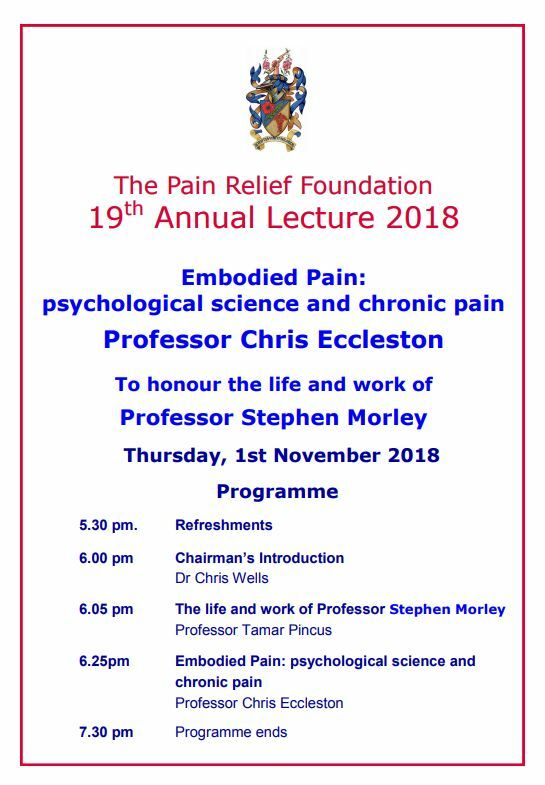 Continuing with the theme of Annual Lectures in which we explore all aspects of chronic pain, the 2018 Lecture “Embodied Pain: psychological science and chronic pain” will be presented by Professor Chris Eccleston who is Professor of Medical Psychology at the University of Bath, UK, where he also directs the Centre for Pain Research. He established the highly respected Bath Pain Management Unit in 1995, developing intensive treatment programmes for both adults and adolescents with chronic pain. He is chair of the science committee for the European Pain Federation. This year he received the prestigious IASP Ronald Melzack Award. The Lecture will take place at the Clinical Sciences Centre at University Hospital Aintree and refreshments will be served from 5.30pm. This Lecture will honour the life and work of Professor Stephen Morley.